Dollar Saving Diva: Skip the Lauren Merkin Sample Sale, and Head to Endless.com for Better Prices and Friends & Family Sale!! Skip the Lauren Merkin Sample Sale, and Head to Endless.com for Better Prices and Friends & Family Sale!! So yesterday I made the trek over to Chelsea in hopes of snagging a discounted Lauren Merkin clutch. Well, I achieved my goal, but not with the same success that I had hoped/expected. I wound up purchasing a metallic version of the Iris clutch for $125 (normally $350+). It was a bit of a compulsion buy, because I had been going into the sale with the hopes of getting an Allie clutch. While I like the bag I purchased, it's not filling any gap in my wardrobe, which is what I try to do when I go to these sales. There were Allie clutches there, but the price range was $150-$175, which was much higher than I was expecting, and I wasn't feeling any of the colors at that price. In fact, the $150 price amounts to a 40% discount, which is good, but if you read my blog frequently, you'll know that LM has on more than one occasion hosted a 40% off sale on her site. AND, as I am writing this, I have stumbled upon a BIG Lauren Merkin Sale on Endless.com. And I'm majorly regretting my purchase, because I'm seeing the Allie bag in the color that I wanted, on sale for $137. Some of the other colors are even less. 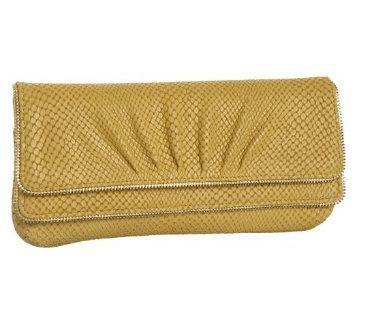 Yellow Snake-print Allie-- $150 at the sample sale, $96 (after 25% discount) at Endless! Not only are the bags on sale, but until March 18, Endless is having a Friends & Family sale, and everything is an additional 25% off, bringing the bag I want to about $103! (Just enter the code MARFFEVT at checkout). I'm so hitting myself now, because I really want to buy it, but am having trouble justifying buying TWO Lauren Merkin clutches in two days (I'm also trying to decide if I need a new pair of shoes!). I will say that for some of the older styles, like Louise and Eve, and some of the smaller clutches like Georgie, the sample sale prices were $80-$90, and those prices are hard to beat--Endless has a somewhat limited selection of bags that low. If you're in the market for one of those, and the Endless prices are higher, I'd recommend heading to the sale. Otherwise, save yourself the stress of sample sales, and check out Endless if you're looking to stock up on clutches, or if you just need a new pair of shoes!